New Zealand is an amazing place! It has beautiful landscapes, a relaxed feel, delicious ice cream, and is easy to navigate. It is also one of the most family-friendly countries in the world! This is huge because there is nothing worse than traveling to an awesome location only to discover there is nothing for your kids to do. 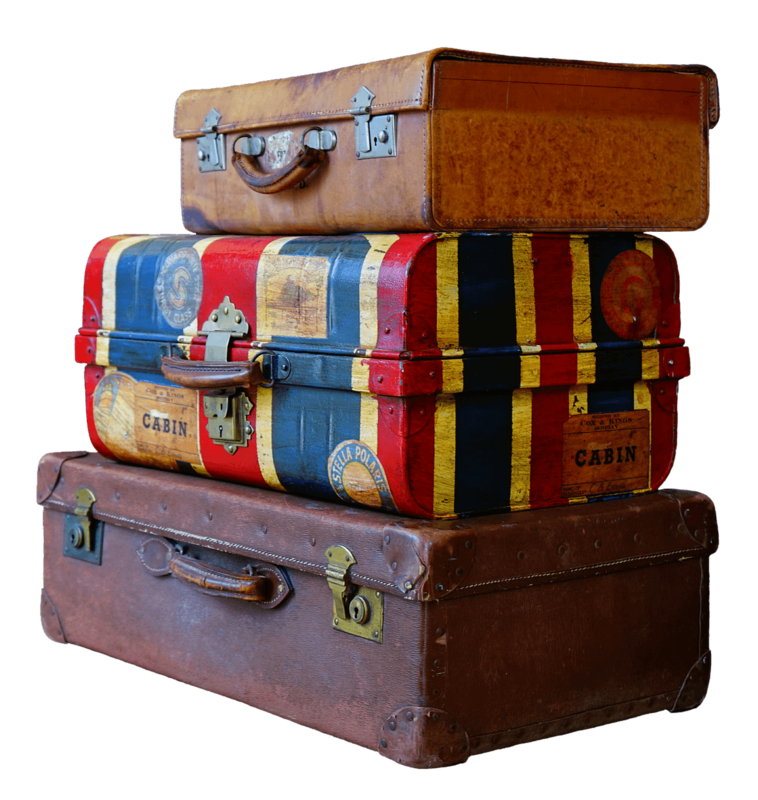 You will find tons of things for kids to do throughout New Zealand. To help you plan your trip, here are 10 things to do with kids on New Zealand’s North Island. Wellington’s Te Papa Museum is, hands down, the best museum I have ever stepped foot in! It has six floors jammed packed with a wide variety of exhibits, ranging from marine animals to art and fashion. Because of the eclectic lineup of exhibits, there is something here for everyone. The museum features lots of hands on exhibits, which kids love. You could easily spend a full day at Te Papa. The best part of this museum is that admission is free! 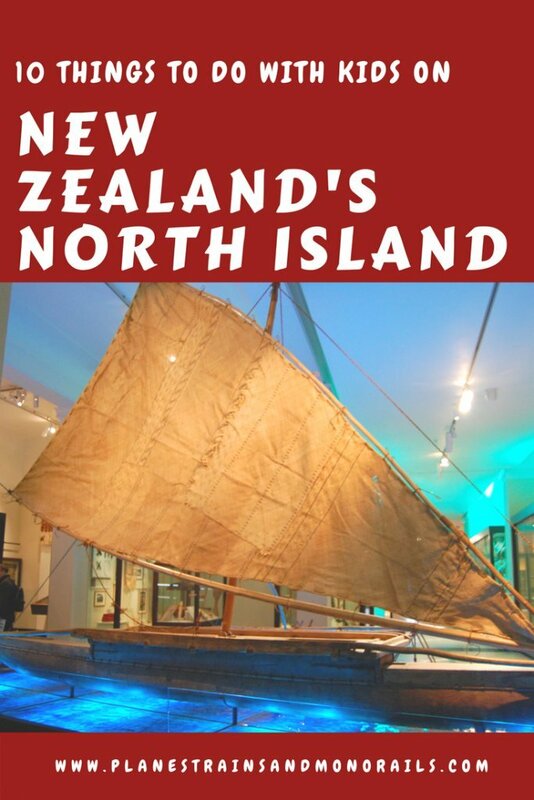 For more information, check out Te Papa’s website. 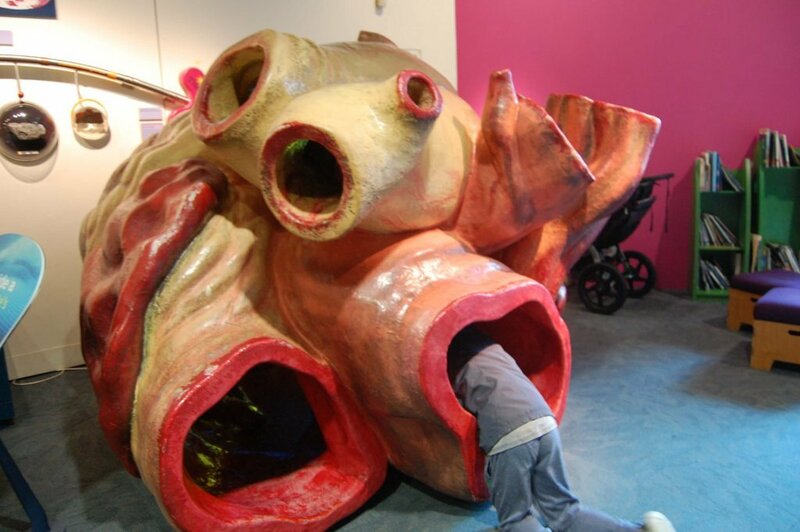 Te Papa has lots of hands on exhibits like this life size model of a whale heart. Kelly Tarlton’s Sea Life Aquarium in Auckland is a hit with kids of all ages. The aquarium has the largest exhibit of Antarctica penguins in the Southern Hemisphere. The highlight, however, is the Shark Tunnels. In the middle of the aquarium, there is an oval room where you can walk through tunnels with tanks containing a variety of sharks and large sting rays all around you. It will give you a unique view of these mysterious animals. You can read my son’s review of the aquarium here. To visit the aquarium’s website, click here. 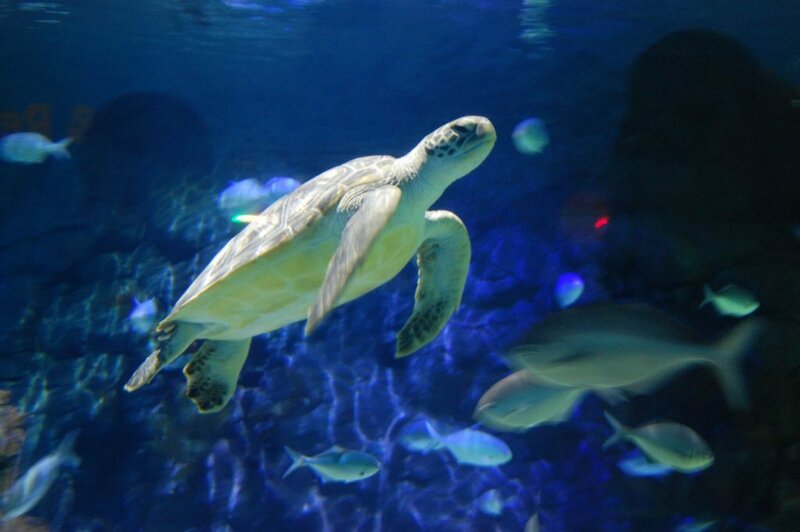 You can get up close with the sea turtles at Kelly Tarlton’s Sea Life Aquarium. Kids love taking unique forms of transportation. The historic Wellington Cable Car is not only a fun mode of transportation, but it is also a convenient way to get to the Wellington Botanical Gardens. As an added bonus, your kids will love the light shows inside of the two tunnels the cable car travels through on its way to the top. Many people take the cable car to the top of the hill and then walk back down. If your children really enjoy the cable car, however, you can easily get round trip tickets and let them have a second ride. Check out more information on the cable car at their website. After riding the cable car to the top of the hill overlooking Wellington, walk over to the Botanical Gardens. The gardens are huge with plenty of space for your kids to explore while you enjoy the beautiful views. Head to the playground to let your children burn off some energy. Check out the Discovery Garden where your kids can get their hands on various aspects of nature, including making their own shelter. The Gardens website will give you more information. 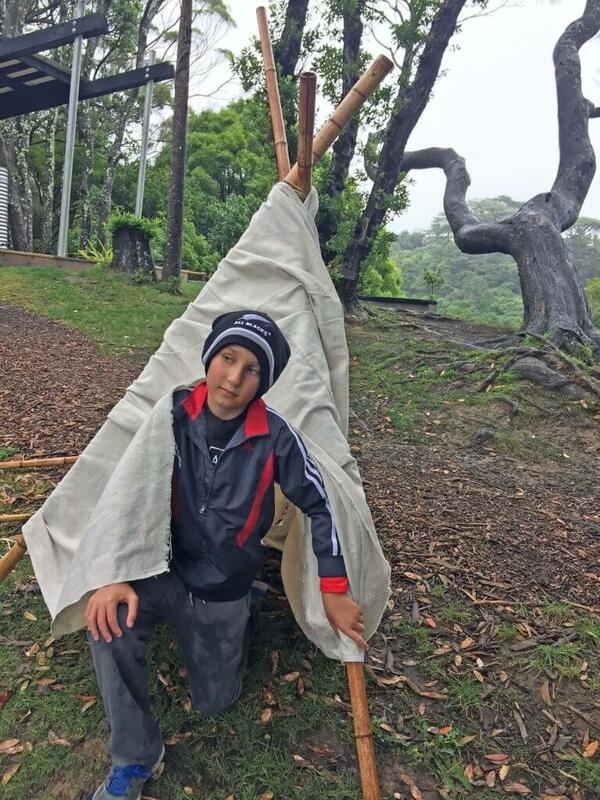 Your kids can build their own shelter in the Discovery Center at the Wellington Botanical Gardens. For your sports-loving kids, take a detour to Palmerston North to visit the New Zealand Rugby Museum. 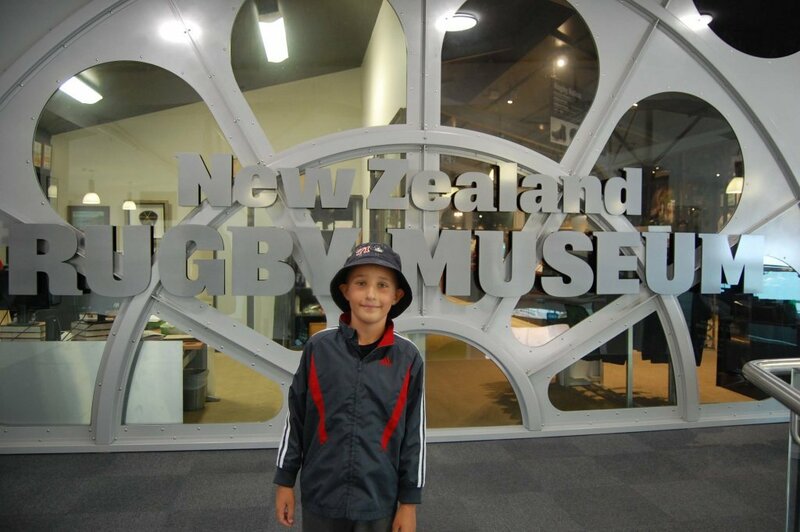 This small one-room museum has exhibits covering the history of New Zealand’s national sport, memorabilia from modern teams, and a skills challenge area where your budding athletes can test their rugby abilities. The museum is located in the same building as Te Manawa, which is a science and history museum aimed at children. While the New Zealand Rugby Museum charges admission, Te Manawa is free. You can easily spend a couple hours exploring the two museums. Find more information on Te Manawa here and New Zealand Rugby Museum here. Your little sports fans will have a blast at the New Zealand Rugby Museum. 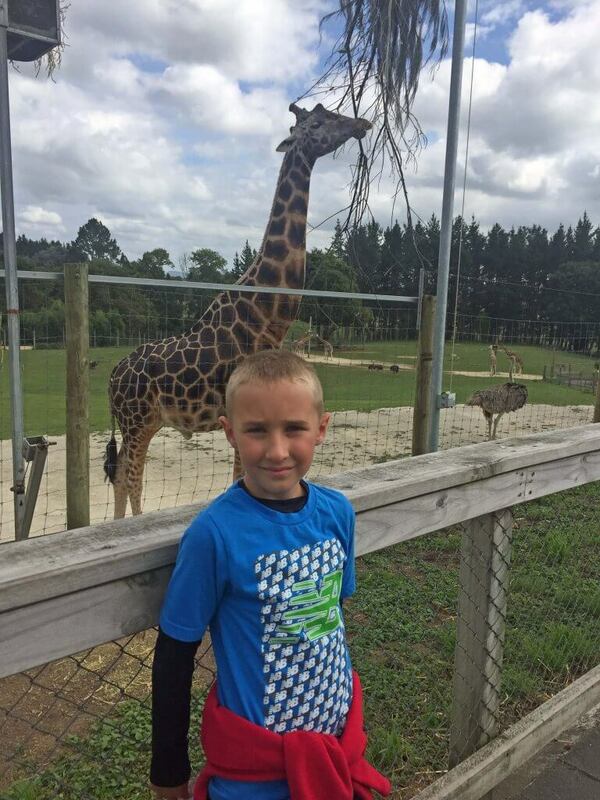 If your children love animals, you can find a number of zoos throughout the North Island. But, to visit the zoo without crowds, head over to Hamilton, just south of Auckland. Hamilton Zoo is smaller than those you will find in Auckland or Wellington. However, this little zoo is a wonderful place to see some animals while giving your kids some freedom to explore at their own pace. During our visit to Hamilton Zoo, we got a personal visit with a zookeeper about meerkats and had most of the exhibits all to ourselves. Find admission prices and operating hours here. Beat the crowds at Hamilton Zoo. The Waitomo Glowworm Caves are one of those ultimate bucket list items. New Zealand is the only place in the world where you can see glowworms in their natural environment. The caves are located a couple hours south of Auckland. The glowworms will blow your mind! I must caution you, however, these tours are not suitable for all children. If you have very small children or some that can’t be still and quiet, please don’t take them to the caves. If, however, your children are at least elementary school age or have adventurous spirits, this is a must do! Check out this post for more in-depth information about the glowworm caves. Whether on vacation or having an ordinary Saturday at home, sometimes kids want nothing more than to just play in the park. 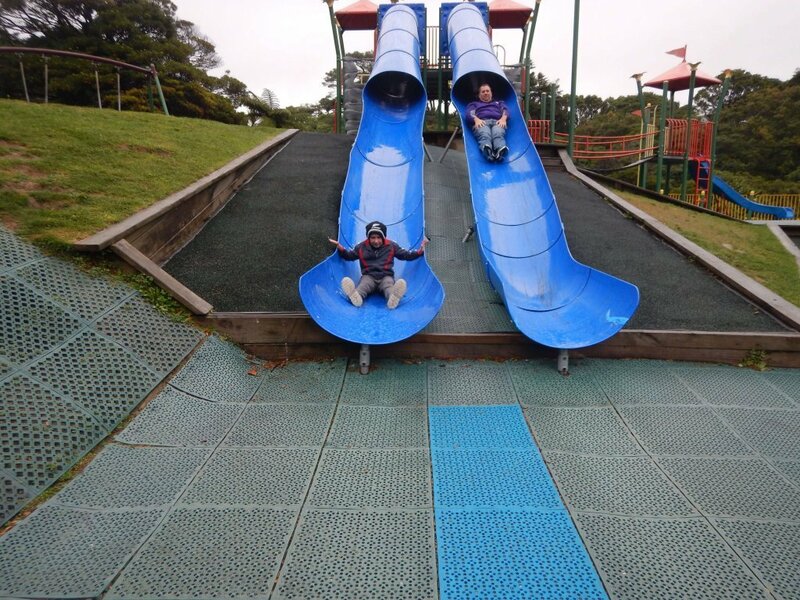 Luckily, New Zealand has a ton of cool parks with unique play structures to keep kids entertained for hours! We played in several parks during our recent trip to the North Island. The parks are all well laid-out and have plenty of space for kids to spread out and run around. An added bonus to spending time in the parks is that your children can burn off some excess energy for free! New Zealand is full of cool parks to play in. New Zealand has some beautiful beaches throughout the North Island. During warm weather, families flock to the beach to splash around in the water and cool off. But, even during the cooler months, kids can have a great time at the beach. During our recent trip, we only had one day to go to the beach and it was cool and rainy. However, my son had a blast at Kai Iwi Beach. My husband and I marveled at the beauty of the black sand while he ran around jumping over puddles and throwing rocks into the ocean. And the best part was that there were no crowds! We had it all to ourselves! Even if it’s too cold to swim, your kids can have fun at the beach! Auckland Museum is a history museum and war memorial all rolled into one. 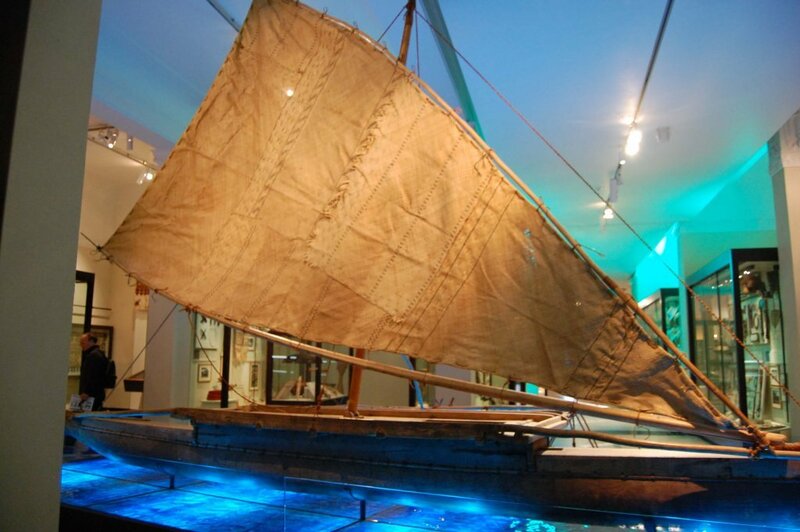 The first floor features some magnificent Maori artifacts, including a full size war canoe. The highlight of the second floor is the volcano room. On the top floor, you can see tributes to all of the New Zealand soldiers who died in war. Also on the third floor are two life size war planes. This museum appeals to all ages. My husband loved the Maori exhibits while my son was fascinated by the war displays. For more information, visit the museum’s website. Auckland Museum has lots of cool Maori artifacts. If you are looking for vacation ideas that appeal to kids as well as adults, look no further than New Zealand’s North Island! New Zealand has it all: beautiful landscapes, kid-friendly parks, wonderful people, and tons of things to do! 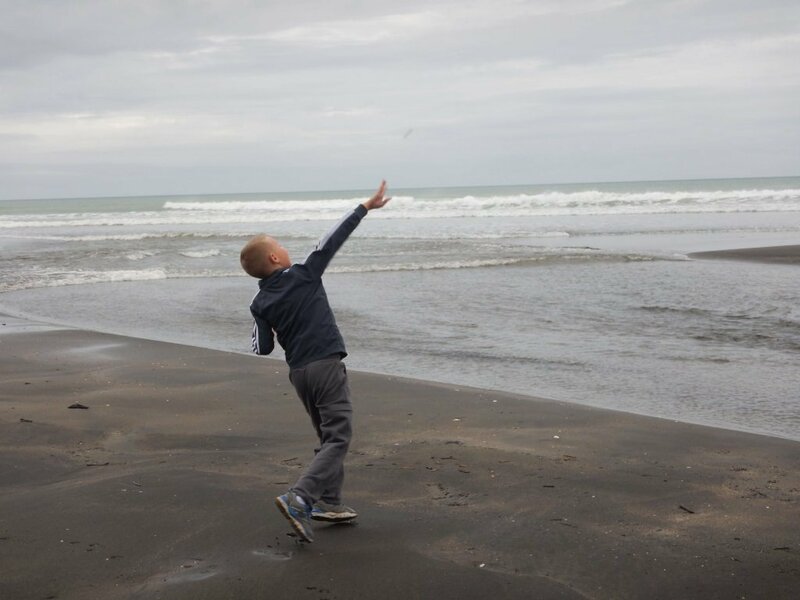 This list of 10 things to do with kids on New Zealand’s North Island will get you started on a fun trip with your family! Happy travels!